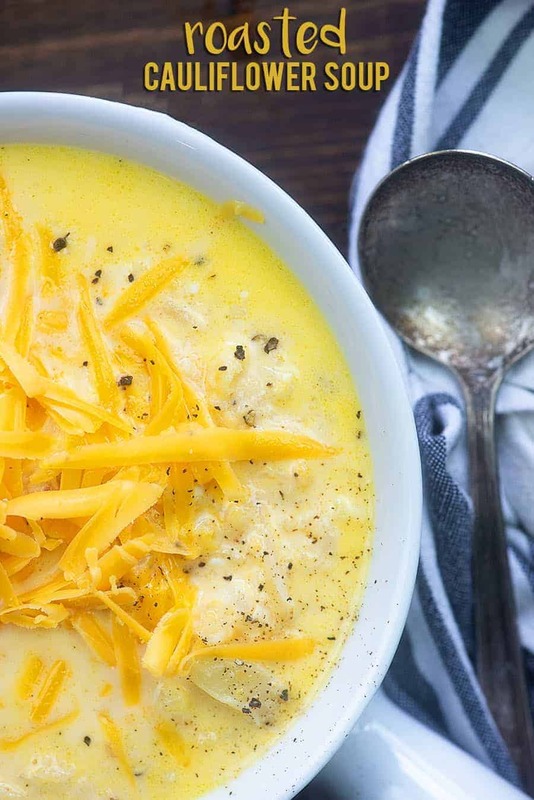 Roasted cauliflower soup is a healthy, low carb dinner option that’s perfect for chilly nights. Top it off with some grated cheddar and fresh cracked pepper. Just 5 net carbs per serving. You guys, I have big news. I made this cauliflower soup with onions and my husband ate it and asked for seconds. The man has never eaten an onion without complaining (and often gagging, if we’re being honest) so this was a success story. He doesn’t seem to mind the flavor, but the texture really turns him off, so I’m now on a mission to add onion to all of our soup recipes and see what he thinks! This healthy cauliflower soup was honestly a big hit with my whole family. My daughter turned her nose up at it when she saw it (let’s be real – it’s not the prettiest soup), but once I convinced her to try a bite, she ate an entire bowl happily. I’m so happy it’s soup season. We’ll be eating lots of this plus my chicken zoodle soup and my low carb taco soup all winter long! To start, you’ll want to roast some cauliflower. I buy a bag of cauliflower florets, because it’s easy, but you can buy a head of cauliflower and chop it yourself if you prefer. Drizzle the cauliflower with olive oil and then sprinkle with a little salt and cayenne. You can swap in paprika if you don’t like the kick. As it is, this really isn’t spicy. Pop the cauliflower in the oven and let it get nice and toasty for about 20 minutes. Meanwhile, heat some olive oil in a soup pot or dutch oven and cook some onion and garlic. Once those are soft, add your chicken broth and the roasted cauliflower. Simmer for about 20 minutes. When the cauliflower is nice and soft, use a potato masher to mash the cauliflower up. It’s not pretty, but man, it tastes so good!! Add in some heavy cream, cream cheese, and grated cheddar and stir until melty and smooth. This cauliflower soup is seriously good and so flavorful! Spinach Stuffed Chicken: The most popular recipe on my site – it gets rave reviews! Jalapeno Popper Chicken: I love the spice of jalapenos in this recipe! Stuffed Zucchini: If you’re craving pizza, this is a tasty recipe! Chicken Casserole: Made with cauliflower rice, fresh broccoli, and chunks of chicken. 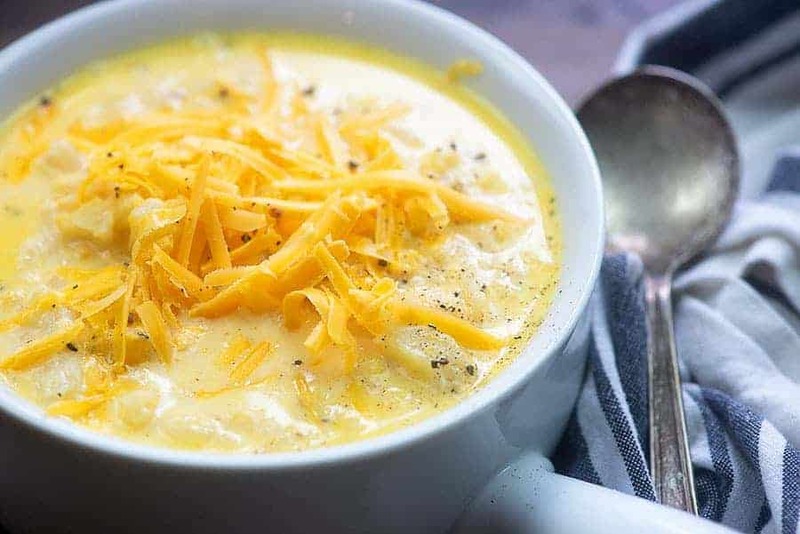 This roasted cauliflower soup gets loads of flavor from the roasted cauliflower and cheese. 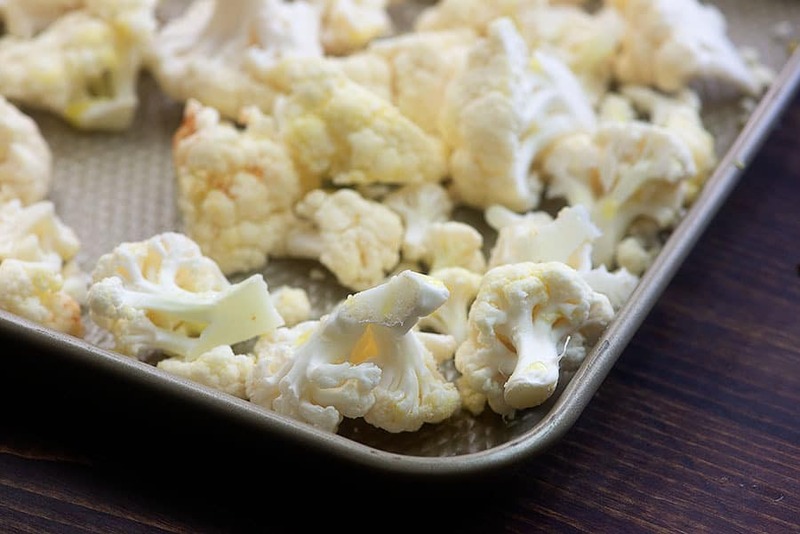 Place cauliflower on a large rimmed baking sheet and drizzle with 2 tablespoons of olive oil. Sprinkle with salt and cayenne pepper and stir to coat. Roast cauliflower for 20 minutes, stirring once halfway through cooking. 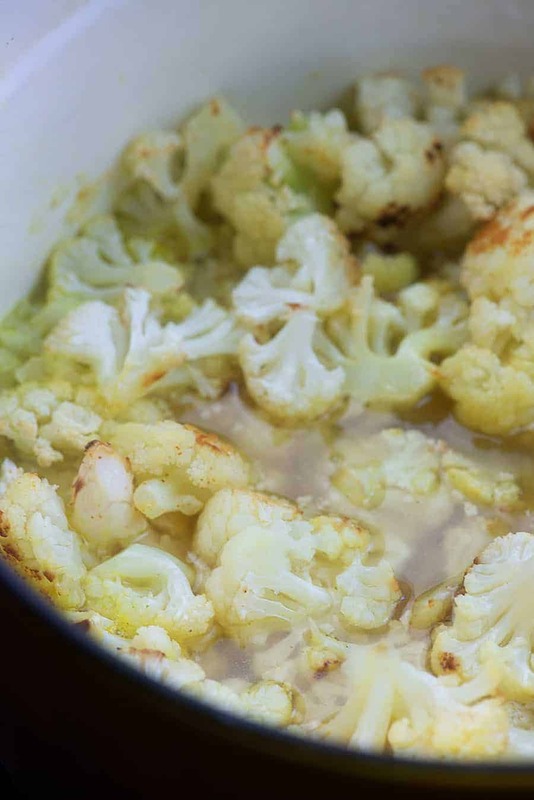 When cauliflower has finished roasted, add the remaining tablespoon of olive oil to a large soup pot or dutch oven over medium heat. Add the onion and garlic to the oil and cook for 5 minutes or until onions are soft and translucent. Add the chicken broth to the pot along with the roasted cauliflower and bring to a boil. Reduce to a simmer and cook for 15 minutes. 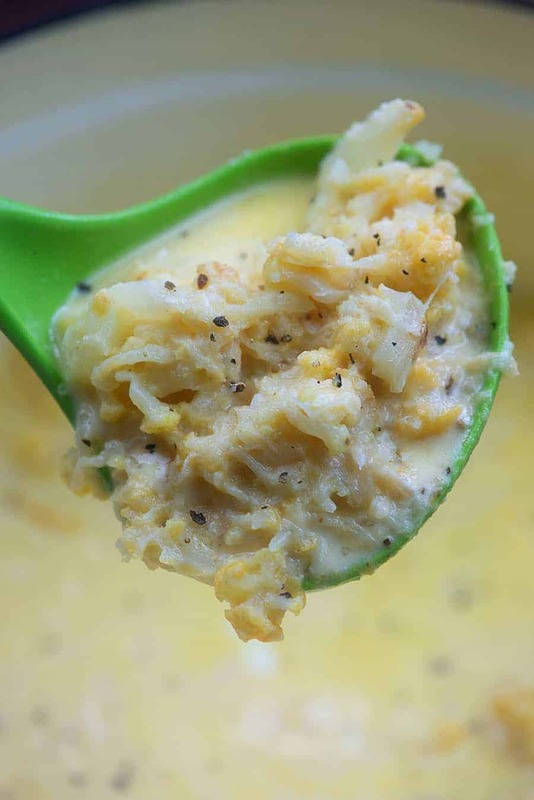 Use a potato masher to the mash the cauliflower. 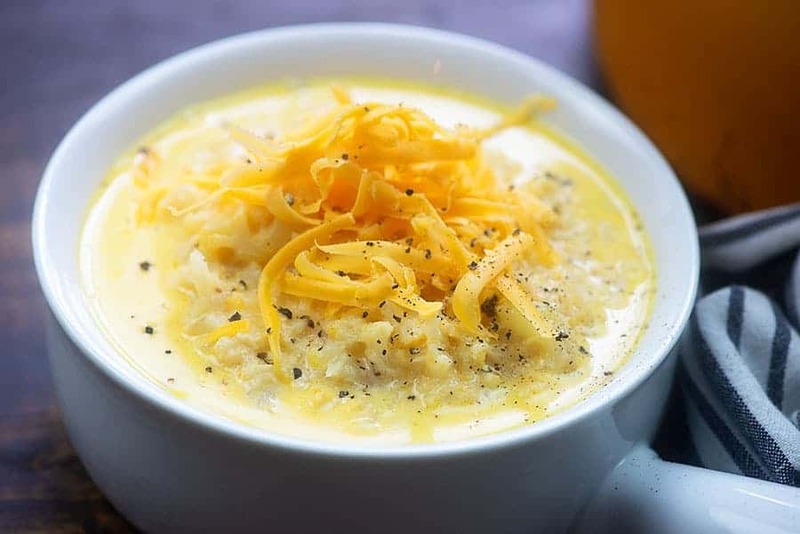 Stir in the heavy cream, cream cheese, and grated cheddar until smooth and creamy. Serve with additional cheese, if desired. Use vegetable broth to make this dish vegetarian. Top this off with grated cheddar, green onions, and fried bacon. My household agrees with your husband on the onion thing. Flavor is great, texture not so much. I frequently use onion powder in soups. Can’t wait to try this soup and may even substitute and use broccoli in the future. Thanks for all the yummy recipes and great writing! I’m sure it would be great with broccoli! I can’t wait to try this soup! Seriously, I’ve been trying so many of your recipes and every one has been a hit! For the last two nights, my husband and I have feasted on the Million Dollar Spaghetti Squash Casserole. Holy, Moly, I mean Feasted! Keep up the good work for me, Karly! you need a way we can print your recipies. Did you try clicking the print button located in the recipe card? I suggest grating the onion if texture is the issue.it becomes more of a juice. All the flavor and none of the texture. Call it tricky for the picky. does a cup equal one serving? It would be really helpful if you could tell us how much a serving consists of next time you make this just measure the final product. Otherwise it’s hard to evaluate whether it makes sense to make it for an individual’s personal nutritional profile. Hi there! I calculate nutrition strictly as a courtesy and you should really be calculating this yourself if you’d like to ensure it’s accurate. I’m not a health care professional and don’t guarantee the nutrition information. If you’d like to find the volume of the serving size, you can make the recipe and portion it out as you see fit and calculate from there. I visually assessed this to be 8 servings and calculated nutrition that way. If you’d like to calculate by volume, feel free. I just don’t have the time. Ok got it. I made this it was very tasty. My yield was 56 ounces total. I get that the nutrition is a courtesy and I do calculate my own nutrition based on what I use, but telling people what your recipe yields is kind of basic and shouldn’t really take time just use a standardized measure as you portion it out. Wow! Super delicious. I added an extra cup or so of water and blended around 3/4 of the cauliflower after mashing to get a mostly creamy soup. Additionally, I used a fresh jalapeno instead of cayenne powder. 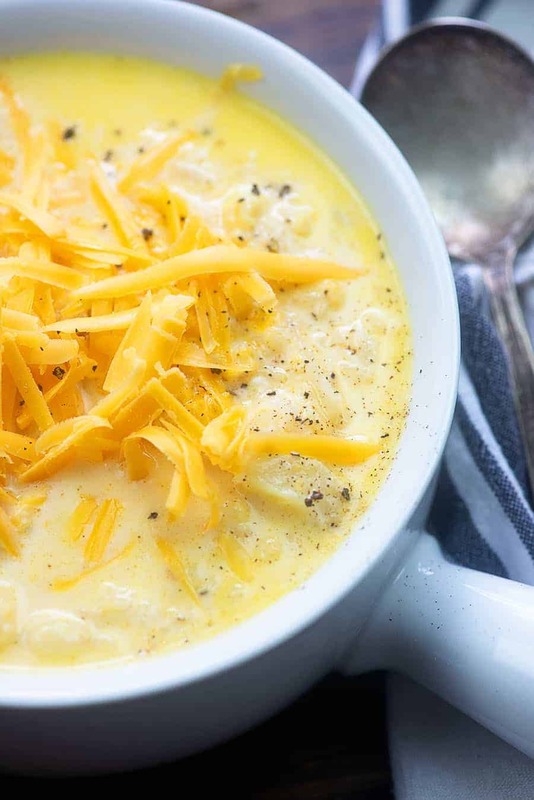 It reminds me of a creamy cheddar and potato soup. I will definitely be making this one all winter! This soup was excellent it was creamy and I also added jalapeno and it made an excellent addition to an already scrumptious soup. 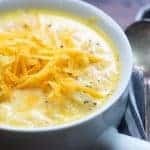 I agree that it reminded me of potato soup and kind of took that craving away for one of my favorite soup before ” carb friendly ” eating will be making this a lot. Ooh, I bet the jalapeno was a great addition! I am currently making the soup for the second time, and I thought I would leave a quick comment saying how easy and delicious it is. Thank you. The nutrition is calculated based on this making 8 servings. I didn’t measure the servings by volume. Absolutely delicious!! My husband hates broccoli and cauliflower soups. I don’t care, all the more for me to enjoy!! Had 2 bowls the first day. Shared a bowl with my friend. She loved it too! Will definately make again, but won’t be too quick to share next time. Yummy thanks! Can frozen riced cauliflower be used? I haven’t tried it with frozen, but it would probably work. You’ll want to adjust the roasting time as necessary. Made this tonight and it is absolutely amazing!! I used my emulsion blender because my husband doesn’t like the texture of riced cauliflower….weirdo, haha. Next time, I will triple the recipe so I have lunch for the week. This was amazing! So tasty and not difficult to make. I used vegetable broth instead of chicken and it was fabulous. We had it for dinner last night and lunch today. Thanks for sharing! This soup was delicious! Even my son, who hates cauliflower, loved it (of course, I didn’t tell him it was cauliflower until after he ate it). I pureed it, instead of mashing it, and it had a nice, creamy texture. The cayenne was such a nice touch. Thanks! I never tell my kids they’re eating things they hate either. It’s just good parenting. 😉 Glad you all enjoyed!